Teeez Outta Control. This must be my favorite purple, EVER! 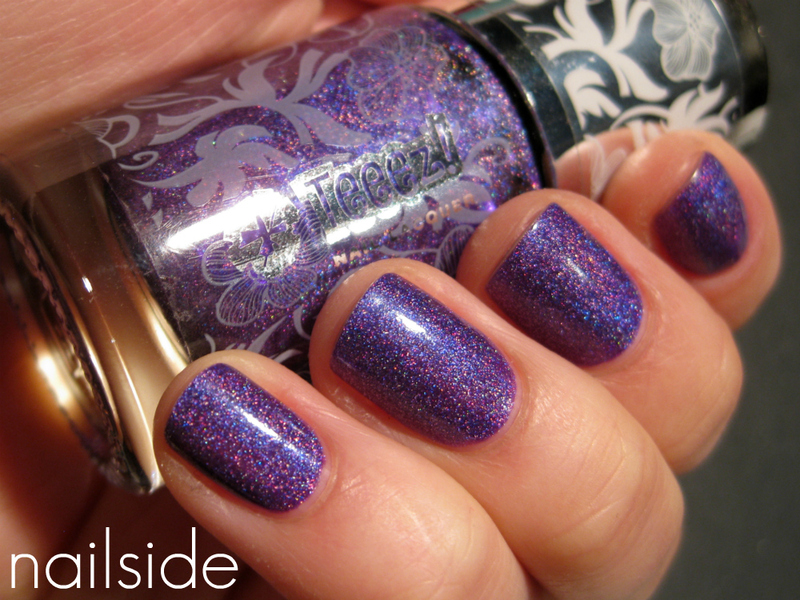 It's purple, prismatic and the formula and application are excellent. This is two coats over Orly Bonder basecoat and no topcoat, because it's so shiny by itself. Today's already the third day I'm wearing it, I can't get enough of it! I once showed Outta Control before here in an accent nail mani, but I love it so much that I had to share it one more time. :-) Thanks for stopping by! I bought mine from Etos, a Dutch drugstore. But unfortunately I don't know whether it's sold online. Stunning! I can see why this is your favorite! That's gorgeous! Do you have a swatch of it without a base color? OOh sorry, I thought I read you had two coats over an Orly basecoat with color! lols Well it's still gorgeous! i want! i want! where do i get this in the us? Hi this looks brilliant! Can i buy in the UK? So pretty color! Like that! This is such a brilliant purple! i love it! :D this is a beautiful purple. So gorgeous! I need to find a way to get my hands on it in the US! I think that's the perfect purple I've been searching for! Thanks for the swatches! Not a shocker that's your favourite purple ever.. It's so freakin gorgeous! Echt een super mooie kleur! Can you buy this type of nail polish at like Fred Meyer, Target or Walmart? ?